Loganair has stepped in to secure three key air routes from Aberdeen following news that Flybmi has gone into administration. Beginning on 4 March, Loganair will operate flights from Aberdeen to Bristol, Oslo and Esbjerg. There will be daily weekday rotations between Aberdeen and Denmark's fifth largest city of Esbjerg. 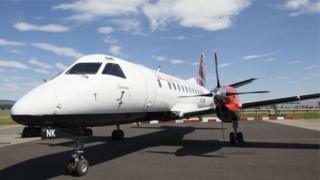 Loganair will also run six services per week to Oslo on weekdays and six days a week to Bristol. Although there will be no service to Bristol on Saturdays, the 49-seat Embraer 145 aircraft will run two southbound services each Sunday. The immediate cancellation of all Flybmi flights, including the three served by Aberdeen International Airport, was announced on Saturday night. In a statement, the company said: "We sincerely regret that this course of action has become the only option open to us, but the challenges, particularly those created by Brexit, have proven to be insurmountable." The move by Loganair will considerably expand its presence at Aberdeen Airport, where the airline already operates more than 50 flights a week. Jonathan Hinkles, Loganair's managing director, said: "It's always really sad to see an airline go out of business, and our thoughts are with all those affected - particularly staff members. "We're working on employment opportunities for pilots, cabin crew and engineering support staff to strengthen the Loganair team. "There is no doubt that trading is tough, but Loganair is - we believe - in the strongest position of any UK regional airline. "We've done a lot of work over the last two years to secure our future as an independent regional airline, and despite the challenges posed by fuel and carbon costs and Brexit, we are strongly placed to take up new opportunities as they arise." He added: "Our three new routes from Aberdeen complement our existing activity across a distinct geographical area, acting as a logical fit with our network - while also markedly increasing the airline's presence in Aberdeen." Flybmi operated 17 aircraft on routes between 25 European cities, with the East Midlands-based firm employing 376 people in the UK, Belgium, Germany and Sweden. Customers who had booked flights with the airline have been advised to contact their credit or debit card provider, or their travel agent. Caroline Stewart recently moved from Aberdeen to Esbjerg in Denmark and had been due to visit family and friends in Aberdeen next month. Her mother had also paid for a flight to Esbjerg and Ms Stewart was due to return for her friend's wedding at the beginning of April. Her brother-in-law had also paid out for flights. "My best friend is getting married next month so I was heading home for her hen party and her wedding and it's also my granda's 88th birthday party," she told BBC Scotland before Loganair's announcement. She said her family were out of pocket by about £1,000. "We didn't use a credit card, we just used a debit card," she said. "And it will be too expensive for us to rebook. "There was absolutely no warning. My husband only booked his flight two days ago and the money has been taken out of his account." A Flybmi spokesman said: "It is with a heavy heart that we have made this unavoidable announcement. "The airline has faced several difficulties, including recent spikes in fuel and carbon costs, the latter arising from the EU's recent decision to exclude UK airlines from full participation in the Emissions Trading Scheme. "These issues have undermined efforts to move the airline into profit. "Current trading and future prospects have also been seriously affected by the uncertainty created by the Brexit process, which has led to our inability to secure valuable flying contracts in Europe and lack of confidence around bmi's ability to continue flying between destinations in Europe." The Civil Aviation Authority also published advice for travellers.